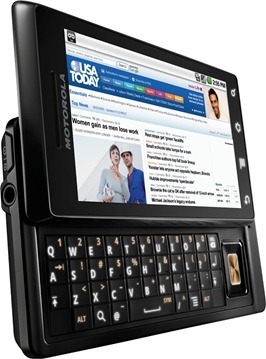 It’s been only a week since Motorola launched its top of the line Droid phone on Verizon in United States. This new generation of CDMA mobile has quickly gained a higher popularity graph, and was well received against the HTC Droid Eris also launched on the same day. Simultaneous launch of the two Droid phones by Verizon on same day wasn’t really a coincidence, but done intentionally to attract different type of audiences. This action of Verizon however, led to a bit of confusion as to which one is better than other. In our earlier post we had carried out a head-head comparison of the the two Droids in the Arena. Motorola Droid was also compared with HTC HD2, and later weighed against another contemporary iPhone 3GS. It looks like, atleast so far, Verizon has a winner in its hands! According to the data collected on November 12th, only a week after of its launch, Verizon’s Motorola Droid has managed to grab 2.84% of all mobile Internet traffic in the United States. In quantum it may not appear that significant, but taking into consideration the fact that the Android OS only accounts for around 8% of the US Internet traffic, is a clear indicator that Motorola Droid has already snapped a quarter of all Android mobile Internet traffic in the United States. This itself is a big achievement for the newly born Android 2.0-powered Droid phone. 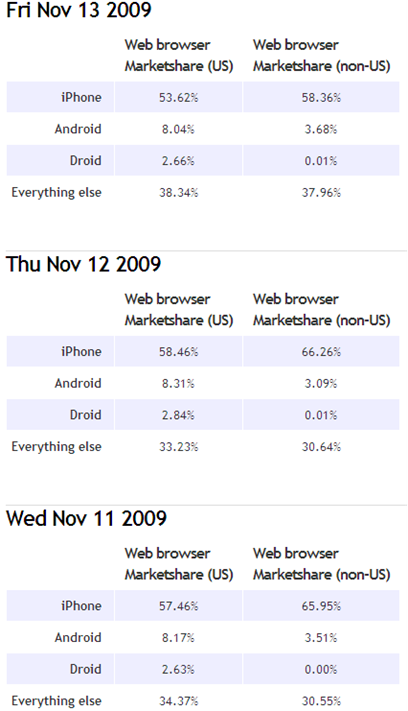 The table shown below shows how Droid stands against iPhone, Android in general and other mobile platforms in terms of web browsing market share in US for November 11, 12 and 13. Motorola Droid or HTC Droid Eris, whoever captures the Android market of US, the beneficiary in any case will be Verizon. Launching both Droids on the same day was really a smart move by the US-based smart phone carrier. I'm really confused….where do these numbers come from? They seem pretty suspicious, namely that the iPhone is significantly MORE popular in non-US locales than it is in the US. Given that most of the world doesn't particularly care about the iPhone, certainly not when held against the big internet players like Nokia and BB traffic….something seems off about this data. Where did it come from? Getclicky says it comes form “150000+ websites”, but since they're targeting mobile sites, and the Droid browser doesn't report itself as a mobile browser by default (neither does Opera, for that matter)…? I just find it hard to believe that the iPhone is responsible for 2/3 of mobile web browsing WORLD WIDE, since in both Japan and most of Europe, it isn't doing all that well. I think that this is a good phone and that i recommend it highly to everyone thats looking for a phone that a has good web and internet connection.